Fruitless Pursuits: What!? 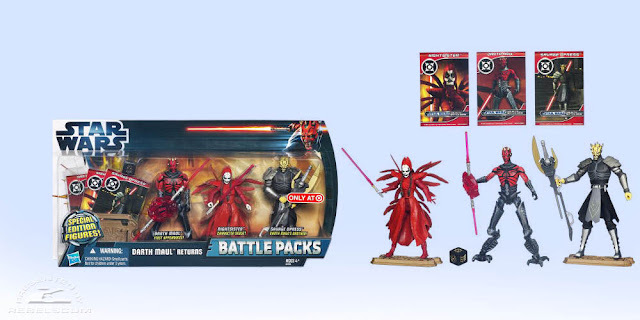 New Star Wars Figures?! Mother Talzin Makes the Cut. What!? New Star Wars Figures?! Mother Talzin Makes the Cut. This year it's like Hasbro's long-running Star Wars figures have gone into hiding. Even online they are rarer than unicorn fingers and it feels like it's been a long time since we've had any significant news. Even in the Clone Wars line the focus has shifted to continuous updates of core characters, and the obscure fringe character coveted by crotchety old collectors are mostly missing in action. This image is from Rebel Scum who could service themselves with a more legible watermark. Yes, I'm talking about Mother Talzin, the spooky Nightsister leader who is derived from some discarded Episode One concept art. NEVER throw anything away! I believe a Lucas intern had just eaten a particularly greasy hamburger and was about to wipe his glistening maw with the discarded sketch and George Lucas himself burst in and bellowed, "NO! I just invented something called a Mother Talzin!" and he wrestled the sketch from the terrified intern's hand. Although I might have dreamed that. Also included here is Lucas' other off-the-cuff invention, Darth Maul's yellow brother Savage Oppress. Their mother owned a copy of Most Depressing Baby Names Ever. Not too exciting as we've seen Savage twice before, but the Roboleg Maul is brand new, although I would have preferred his crazy spider body. Still, it's great to see something new and I look forward to paying five times the retail price for this on ebay!